В ролях: Cindy Cheung, Michael Chen, Crystal Chiu, Stephen Gevedon, Frank Pando, Kieran Campion. Название: Кто убил миссис Де Ропп? 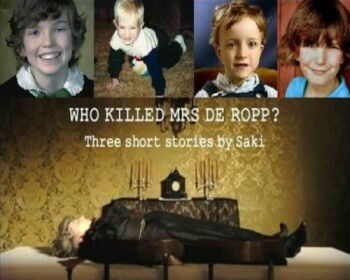 Оригинальное название: Who Killed Mrs De Ropp? Бен Дэниелс, Джемма Джонс, Томас Бирн / Thomas Byrne, Билл Милнер / Bill Milner, Сэм Хонивуд / Sam Honywood, Джулия Джойс, Эндрю Бирн / Andrew Byrne. Made for television as part of BBC4's Edwardian season of films, based on three stories of Saki, "The Storyteller", "The Lumber Room" and "Sredni Vashtar", each one telling a cruelly funny tale of children using their imagination to overcome their repressed upbringing. While traveling on a train, a bachelor finds himself with a stiff, elderly woman and her three young wards. They are bored and, as such, unbearable company as they shuffle, sing and generally make noise and distraction. The attempt by the woman to tell the children a story backfires spectacularly and is met with general polite derision. So the bachelor himself decides to try - much to the stuffy amusement of the woman, who assumes that if she cannot entertain them then surely this bachelor will have no hope. The opening lines suggest that she is correct - however the bachelor goes on to fire their imagination much more. Maikel Andressen Abou-Zelof, Jalal Zahedjekta, Sharjil Arshed, Mickael Marman, Seth Raknes. Jonas and Emir are members of a criminal gang of 14-15 year-olds in Oslo. Emir has slight brain-damage after being beaten by his father as a 5-year-old, and Jonas' biggest problem is stopping Emir from hitting people on the head. One day, they are offered a job by a gang of drug-dealers: Deliver a packet of heroin to one guy and beat up another. This is the start of a chain of events that sends their lives spiraling out of control. В ролях: Эрик Робертс, Сьюзан Сарандон, Брук Шилдс, Corey Einbinder, Matthew Laborteaux, Artie Cavallo, Glen Gianfrancisco, Blake Brocksmith, Matteo Cafiso. По мотивам книги "Король цыган" Питера Мааса (Peter Maas). Действие картины происходит в нью-йоркской общине цыган. Стареющий и близкий к смерти патриарх по закону предков должен передать правление своему наследнику. Но сын его не способен мудро управлять своим народом согласно традициям, он считается всеми непутевым — "ему бы лишь пить, танцевать, веселиться и драться". Власть передается внуку (первая роль в кино Эрика Робертса). Обойдя соперника, молодой король цыган обретает смертельного врага в лице собственного отца... Главная ценность в этой картине — блистательная игра всех актеров, всеми своими недостатками фильм обязан только режиссуре. Следует отметить операторскую работу Свена Нюквиста, постоянно снимавшего для Ингмара Бергмана. В ролях: Joselito Jiménez, Carlos Larrañaga, María Mahor, Tomás Blanco, Fernando Sancho. Дэвид Хэйг, Дуглас Сторм, Мартин Лэйн, Rory Macfarquhar, Oliver Hicks, James Mills, James Guest, Philip Dragoumis, Mark Wallace, Chris Chescoe, Дженнифер Харрисон. "Dark Enemy" is a terrific Children's Film Unit production brimming with ideas. Set in an idyllic looking post apocalyptic world, a small group of people, survive on the land. The valley people are threatened by the mysterious mutants known as the moonchildren who haunt the woods and slopes above their valley at night. Three boys set out on a quest to determine who will be the next leader. The youngest of the three, Aron, makes a discovery about the true nature of their world and what caused the apocalypse. This is a absolutely cracking science fiction adventure which is something of a lost classic. Some of the cast will be familiar to those who have seen "Swarm in May" shot the previous year. The Children's Film Unit still continues to make films with children producing short films. After a nuclear war, a group of children at an isolated farmhouse debate what the outside world might be like. Soon one of them leaves the house to investigate, and finds out that things aren't the way they thought. В ролях: Blake Bashoff, Craig Wasson, Brian Reiser, Evan Greenberg, Jason Fischer. What should an 11-year-old boy do when one of the people he trusts the most - a Catholic priest - sexually abuses him? This fact-based drama is the story of Calvin Mire, an innocent altar boy whose dream of serving God turns into a nightmare when he is molested by his parish priest. В ролях: Арнольд Вослоу, Матис Ландвер, Саймон Даттон, Joey Stetz, Джеф Байон, Стефан Бикер, Кен Бонс, Аннетт Калп, Марио Иррек, Вальдемар Кобус, Беттина Лампрехт. В ролях: Олег Кремнев, Анна Коршук, Валерия Киселева, Светлана Киреева, Алексей Соломатин. Мальчика обвиняют в краже соседских денег. Теперь квартирная хозяйка требует, чтобы они с матерью немедленно съехали.